The Ultimate Multiplayer Experience for your iPad. This app enabled accessory immerses you in game play as good as a tournament grade table. 30-pin version compatible with iPads 1 - 3 & Bluetooth® version compatible with ipads 3, 4, Air, and Air 2. Welcome to the world of Foosball! 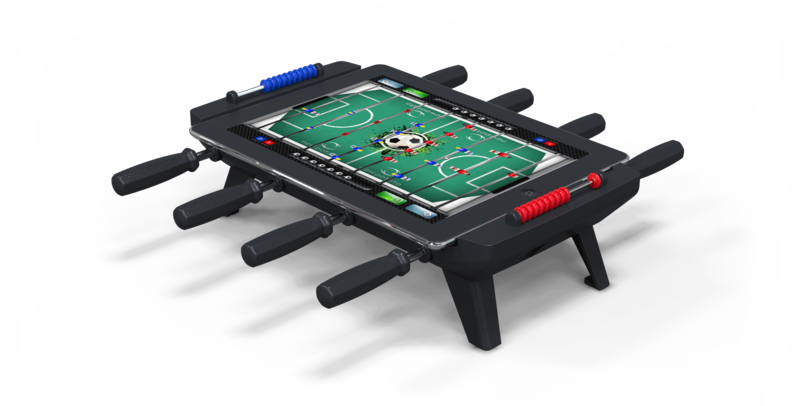 Classic foosball has been brought into the future with New Potato's Classic Match Foosball for iPad accessory. Now you can work your pull, snake, bank and bread and butter shots, fake out your opponent and deliver the ball into the goal with a resounding "thunk", all on a table top foosball dock for your iPad. Just like real tournament tables, Classic Match Foosball brings the complete foosball experience to your iPad! Complete with eight functional 2-axis control bars and real scoring markers at each end, this app enabled accessory immerses you in game play as good as a tournament grade table, allowing the most expert player to show off their well-oiled skills. Gameplay features all the elements you can think of in a complete simulation, but unlike simple software-only foosball emulation apps, this accessory brings the real deal to your iPad with advanced peripheral-to-game dynamics for an incredible experience. Classic foosball play fields and layouts. Realistic game and crowd sounds. Customize your table and team colors and sponsors. Unparalleled play and feel for iPad. Tournament foosball rules and other challenging games. When you first receive your Classic Match Foosball unit, a few short steps are needed to assemble it. It should take about three minutes complete and no tools are required. Your table is supported by four legs with rubber feet on the bottom. Simply insert each leg into the table as shown and press firmly until the retaining clip clicks into place. For transport or storage, the legs can be removed by gently pulling back the retaining clip and wiggling the legs back out of the bottom of the table. Your foosball table comes with eight control rod cartridges. One of these cartridges must be installed into every hole that is provided on the side of the unit. With the table sitting on a flat surface, simply insert the each cartridge with the retaining catch oriented to the bottom. Gently and carefully slide the cartridge into the table pushing on the plastic cartridge (and not the control rod handle) until the assembly clicks into place. STEP 3: Connect Your iPad and Go! The first time you connect your iPad, you will be prompted to download the FREE app from the online store. Once installed and running follow the optons and process in the app to get to your first game. Is it compatible with my bumper case? Ultimately, this will depend on your case. Some slim cases may work, but others may need to be removed before you place your iPad into the foosball accessory gamming device. Will Foosball for iPad dock drain my iPad's battery? The dock is powered via the 30 pin connector of your device, but uses ultra-low power circuitry which takes minimal power from your battery. The table takes so little battery power compared to the demands of running your iPad, you will not notice. Additionally, the table functions as both a charging and sync doc, so you may connect your iPad to power, while you are playing. Can I use the dock without external power? Yes! TuneLink Home works with essentially all audio apps. This includes most Internet radio apps, games, audio book apps, and more. Removal of the control rods is simple and is the opposite of assembly. Use a small screw driver or other suitable object to press gently down on the retaining catch and carefully slide out the control rod cartridges. Control rod cartridges can be used in any of the eight locations, they are all the same and so their order and placement is not important. Pull back gently on the table leg clips and carefully wiggle them out of the table base. Pack it up and hit the road. How do I get the free Foosball for iPad application? Download Classic Match Foosball TM for iPad from the iTunes App Store. The application can be run without the dock, so you may see how it works, but you will need the foosball table accessory for the complete experience. I can't get it to work with my iPad, what can I do? A simple reboot of your iPad may resolve many difficulties connecting the accessory to your iPad. Orient the retaining catch on the bottom before you insert the cartridge into the table. Be sure to pull the rod part way out of the cartridge before you insert the cartridge into the table. When inserting the cartridge, push on the plastic housing and not on the rod handle to ensure a smooth installation. This technique will make sure that just the cartridge shell is used to guide the cartridge into the table. Once connected to the game, you can sync up the rods with the app by simply pushing the rod all the way in and all the way out and you are ready for LIVE FOOSBALL ACTION!